The thought of somebody like me attending Oracle OpenWorld this past October at first seemed like a stretch. Oracle? Isn’t that some sort of prophesy? And “java,” the programming language, to me typically evokes the smell of strong, sweet black coffee. After all, I’m a business writer, not a developer. I use words, not code. When my laptop freezes, I turn to one of my younger colleagues to get my cursor moving again. Dramatic staircase branding took the conference messaging to new heights. Oracle OpenWorld has evolved well beyond the traditional tech conference model it launched 38 years ago. 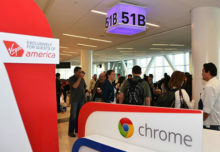 Yes, Information Technology remains near and dear to its core and accounts for more than half of the 60,000 attendees who descend on San Francisco for the five-day show. However, a good many of them also come from marketing, sales, finance, engineering, government, HR and other disciplines that aren’t quite so foreign to me. 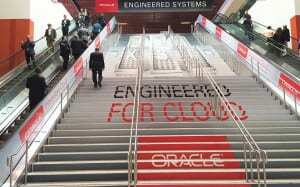 Altogether, 18 lines of business were represented at this year’s Oracle OpenWorld. That evolution has transformed Oracle OpenWorld on a number of levels, from the physical layout of the conference to its more personalized, segmented and targeted attendee engagements. 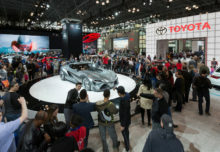 Experiential activations, much like those you’d see at a music festival or a pop-up event, designed to forge an emotional connection between the brand and its attendees, now lends the conference a fun b-to-c vibe. One of those areas is CX Central@OpenWorld, or Customer Experience Central, dedicated to sales, marketing and service professionals. I stop by the second floor of Moscone West, where CX Central is buzzing with sessions, demos, product experts, keynotes, lounges and receptions. An icon and color denotes messaging and content for each business area. Commerce is orange, for example; marketing, teal; social, purple. A social intelligence center, powered by Oracle products, monitors the social communication taking place. HCM (Human Capital Management), or the HR folks as I call them, has a similar set-up at the Palace Hotel, another one of the 18 venues where the conference hosts content. JavaOne attracts a purely developer audience at the Hilton and Parc 55. Back outside, on my way to Moscone North, just as I enter Oracle Cloud Plaza, I behold the America’s Cup—yes, that gleaming, silver trophy, with white-gloved sentinels on either side of it, along with the majestic dual hull of the Oracle Team USA racing catamaran. The city-block-wide plaza between Moscone North and South also is filled with tables and chairs for relaxing, networking and small pop-up meetings. Digital and branding screens hang overhead, displaying messaging from Oracle and its partners, conference updates and the occasional baseball and basketball game. 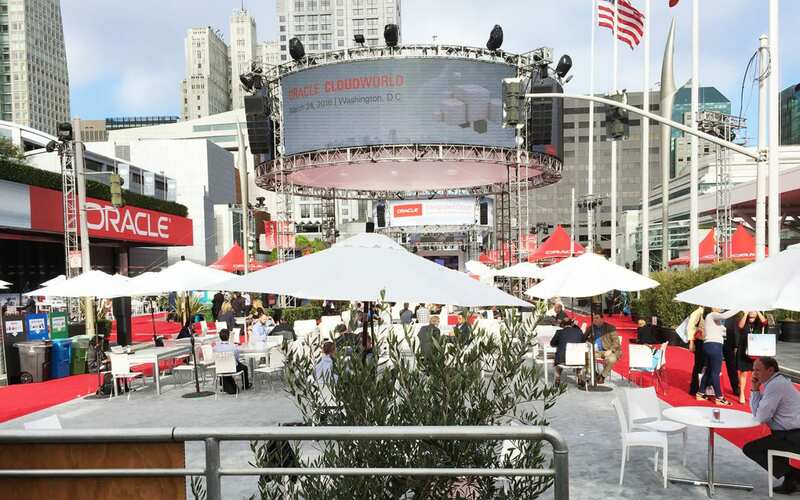 SiliconANGLE’s theCube streams interviews and Oracle OpenWorld keynotes on their channel on the plaza. John Fortt, from CNBC’s “Squawk Alley,” also broadcasts live here. Oracle Broadband broadcasts all the keynotes from Hall D.
The plaza also houses a station for filling the reusable bottles attendees received at registration with municipal tap water and a Nature Conservancy booth, where attendees can donate toward the organization’s Plant a Billion Trees program, or just sit down and enjoy lunch on the comfy chairs. Sustainability is a key goal at Oracle OpenWorld, which seeks to become the most ecologically sustainable conference in the world. The company donated $1 million to the Billion Trees effort, and makes a big effort to reuse signage from year to year, among other environmentally friendly initiatives. 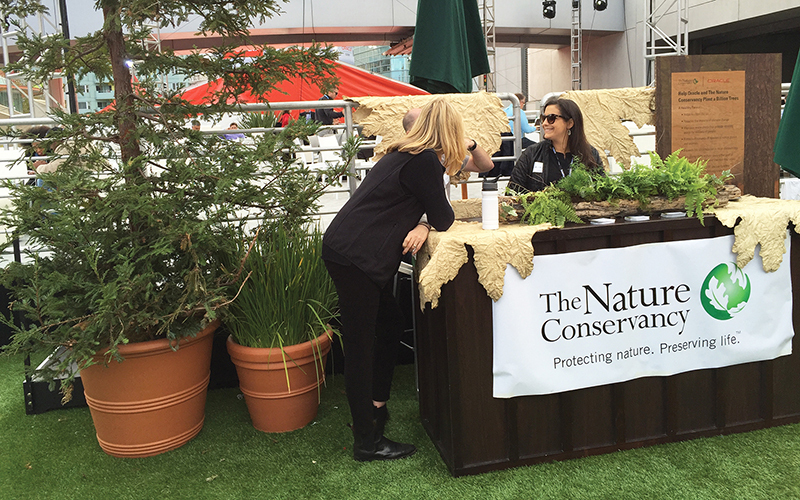 The Nature Conservancy (in addition to an activation by The America’s Cup), helped emphasize Oracle’s winning spirit in racing and sustainability. 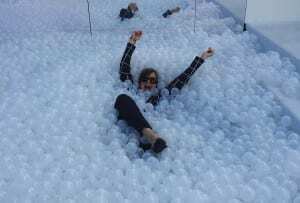 EM features editor Sandra O’Loughlin takes a dive into the Cloud installation. Indeed, fun and playfulness are perhaps as much a part of this year’s conference as the sessions and demos themselves. Another example: four “stumble-upon” moments that catch attendees by surprise and inspire social media sharing. During lunch at the JavaOne Session for Kids, a tech illusionist puts on a 15-minute “wow” moment that leverages iPads and magician high-tech. At the Sunday reception following Oracle ceo Larry Ellison’s keynote, a Brazilian flash mob, complete with drums, dancers and instruments for the attendees, yields a participatory moment. Monday, at the Oracle USA sailing team exhibit, one randomly selected attendee races against a celebrity sailor in a digital challenge—and wins! And at the CX Customer Experience reception, the iLuminate dance company electrifies attendees with an impromptu glow-in-the-dark performance. It’s hard to miss the red Oracle OpenWorld branding that’s on the facades of buildings, barricades, signage and t-shirts people are wearing. Even the staircase risers are plastered with messages from Oracle and Samsung that ascend to the next floor. But it’s not all about Oracle. Testimonials from Oracle partners and customers, including Kohl’s, Lyft, PepsiCo, GE and others, abound on banners and screens throughout the venues, evidence of the conference’s customer-centric focus. With 2,500 sessions, 3,000 speakers and 400 Oracle demos, there’s a heck of a lot more to Oracle OpenWorld than I have time to experience during my day and a half on-site. I hate having to miss Elton John’s performance at the Customer Appreciation Party at Treasure Island. I stick to the exhibit halls, where Oracle partners and customers exhibit their wares and offer all the key components of a conference—learning, networking and fun. 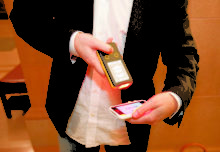 Exhibitors are clustered around specific topic areas, such as mobile or big data. Even here, there are fun experiences such as Lenovo’s Tap and Brew, which serves up coffee to start the day and cold beer to end it. 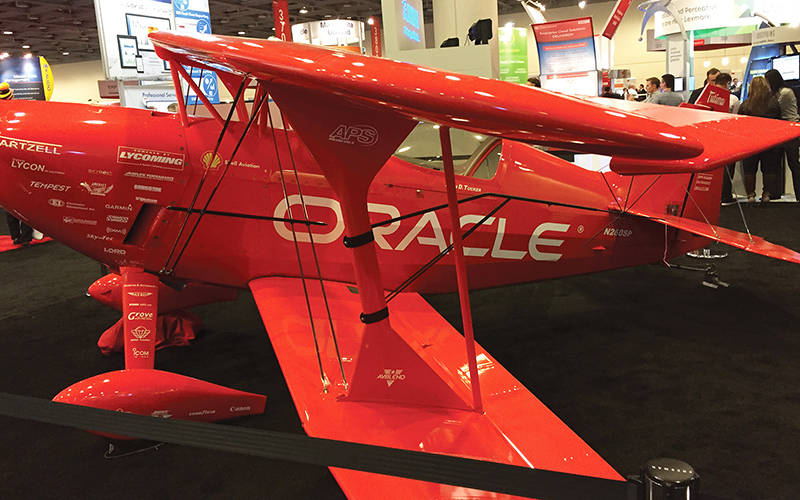 Attendees pose for pictures with the big, red Oracle Challenger biplane in the exhibit hall in Moscone West. And in Moscone South, attendees could get behind the wheel of a racing simulator at the Infosys booth.